Warehousing is essential in Ohio logistics operations, where the goal is faster, cost-effective facilitation of your supply chain. The best warehouse management systems help companies keep pace with seesawing compliance regulations, increasing order cycle demands and oscillating supply chain requirements. It’s no shock the global market for warehouse management systems is expected to climb from $1.7 billion this year to $5.72 billion in 2025, according to Grand View Research. Clearly, a growing number of industries recognize the value of third-party warehousing. Partnering with a trusted Ohio logistics firm allows for all this, plus shared costs. Let’s be honest: Warehouse management is cumbersome. That’s probably why nearly half of small businesses recently surveyed by WaspBarcode (supplier of inventory tracking systems) reported they don’t track their inventory or else use some type of manual process. Furthermore, the 2017 E-commerce Fulfillment Report reveals human error with goods-in is the No. 1 problem in 46 percent of warehouses. That translates to a loss of real dollars and competitive advantage. Soaring costs for storage, labor and other forms of overhead. Rather than committing to the time, expense, labor and oversight necessary to ensure profitable in-house warehousing, businesses are increasingly discovering it makes the most sense to share the burden of space, transportation costs and labor with a well-rated 3PL. With 90,000 feet of warehouse space and the latest tools and technology, On Time Delivery & Warehouse in Cleveland manages warehousing for Ohio logistics clients of varying types and sizes, yet ensures space is tailored and staff qualified to meet the unique needs of every single one. Paying only for space you actually use is a critical price advantage when you can’t realistically fill an entire warehouse with your own inventory year-round. Central locale. Business operations with a centralized location have the advantage of products that are easy to receive, prepare and ship to your customers. 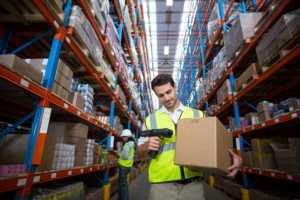 When you work with a well-connected 3PL, you have the advantage not only of their centralized warehousing site, but also their farther-reaching connections. Improved customer service. Whether you’re in business-to-business or direct-to-consumer sales, order fulfillment snags can mean huge headaches. That’s true for national and international suppliers. Your customers don’t care about the complexity of the process. They just want to know you have adequate stocks and orders that arrive on time. 3PL warehousing helps you stay ahead with responsive inventory management and delivery tracking. We also allow customers to keep “security stock” on hand, reducing the odds an unexpected supplier problem will lose you long-time client due to delays. Even anomalous problems can spur customers to look elsewhere. Top-tier technology access. Top Ohio 3PL, warehouse and fulfillment providers rely on the latest software for warehouse and transportation management. That gives you better supply chain visibility, while saving you from having to foot the bill for it yourself. Experience and expertise. You know your business. We know ours. We’ve built one of the best storage, fulfillment and tracking systems and supply chain networks in Northeast Ohio over decades. You get the advantage of our experienced staff and battle-tested systems. If you’re still on the fence about teaming up with an Ohio logistics provider or need to weigh which firm is the right fit, we offer detailed proposals spelling out exactly what you can expect and how we can help bolster your bottom line. If you have questions about Ohio logistics and warehousing management, contact On Time Delivery & Warehouse by calling (440) 826-4630 or sending us an email.